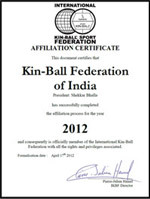 The Federation of Kin-Ball established in 2012 in India to promote the teamwork, co-operation, fitness, accessibility and sportsmanship in India and globally. Kin-Ball invention of Omnikin is a team sport developed by Mr. Mario Demers (President, Omnikin), a physical education professor, in Quebec, Canada in 1986 to improve the innovation of physical education and encourage positive interaction / co-ordination among team players. The Kin-Ball activity increases participation from people of all ages due to its game qualities.The dynamics of this game and its rules make it very useful tool to develop physical education program, enduring co-education and achieving success from the first moments of the day. Its goal: Encourage people to practice physical activities regularly. Its values: Promote co-operation and sportsmanship. Its rules: Promote fair play and teamwork. The sport: An easy-to-learn activity, due to the size of the ball and its lightweight. Three teams of three different colors. Four players of each team playing simultaneously. Players of the defensive team form a square around the ball. This same square constantly follows all the movements of the ball. Each player is responsible of a corner of the square and is placed at about 10-12 ft from the ball. The four players have to maintain the team�s square formation. The hitter has to say �OMNIKIN�� and the color of another team before hitting. If the called team succeed, then it is its turn to hit. If the called team failed, the other two teams get one point each and the faulted team puts the ball back into play. This is a time-regulated game; three periods of 15 minutes. If there is a tie at the end of the game, continue until there is a winner. A player cannot hit twice in a row. The hitter must say �OMNIKIN�� and the color of a team before hitting the ball. The ball must be hit at a minimum of 6' in distance. The ball must have an outward or upward slope; never in a downward slope. Three members of the same team have to be in contact with the ball before the hit. Once your team has had three contacts with the ball, the hitter has only five seconds to hit. Whenever a team commits a fault (like letting slip the ball), the other two teams get one point each. A point is given to the other teams if a player blocks another player intentionally. No points are given; the team who has hit must hit again. Three players hold the ball. The fake hitter is about to hit the ball. While running towards the ball, he shouts �OMNIKIN�� and the color; fakes his hit when he touches the ball and the true hitter hits. Just like running with the ball, passing from teammate to teammate allows a team to choose a strategic offensive position. Usually, the player who passed the ball to his teammates will be the one hitting. 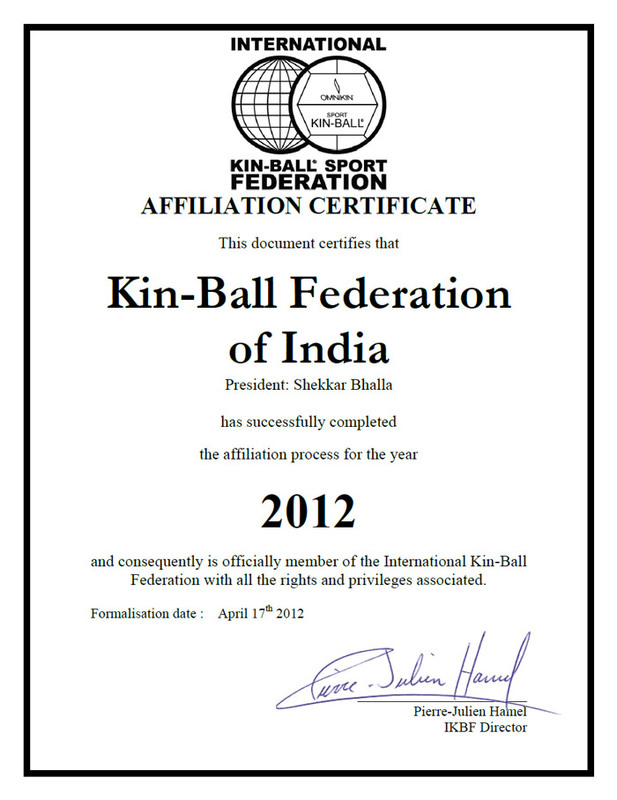 Copyright � 2015 Kin-Ball Federation of India.